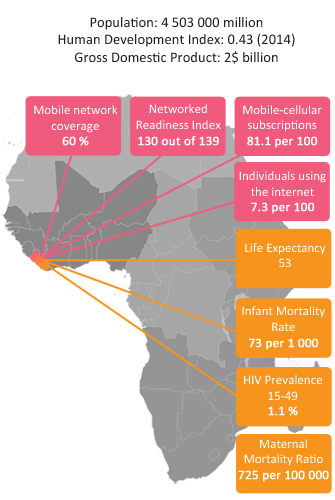 Ranking 130 out of 139 on the Networked Readiness Index, Liberia faces challenges on all 10 pillars of the readiness index, particularly infrastructure and individual usage. Following the Ebola epidemic in 2014-2015, Liberia embarked on a strategic planning process to develop a Health Information System Strategic Plan for 2016 to 2021 which, among other things, addresses the challenges listed above. Liberia has a functional national health management information system (HMIS) which captures data from the health facility on services provided as well as the data on administrative and management outputs. The policy and strategy were developed in conjunction with USAID/BASICS, leading to the development and operationalisation of the architecture and implementation plan. The Health Information System operates through DHIS2. Liberia has updated the national indicators, prepared Standard Operating Procedures, and conducted on-going training. In partnership with USAID/BASICS, MOHSW designed a Community Health Management Information System (C-HMIS). The C-HMIS links information from the services provided in the community to facility level information. The C-HMIS has been designed based on a standard list of indicators reflecting the main services provided by the Community Health Volunteers. At county level, C-HMIS data are processed electronically through the same software application as the facility-based HMIS (DHIS2). mHero is a mobile phone-based system that uses basic text messaging to connect health workers to health officials, to each other, and to critical information that can save lives. It was piloted and scaled in Liberia, starting in 2014 during the Ebola outbreak. The Liberian MOH owns mHERO as their platform. It is now being used in Liberia for a wide variety of use cases implemented including FP commodity, nutrition, and mental Health. Health Information Systems (HIS) Country Profile Indicators from MEASURE.